Catherine was born in 1806 in Fain-les-Moutiers, Burgundy, France. Catherine was the eighth child in her family and grew up on a farm. 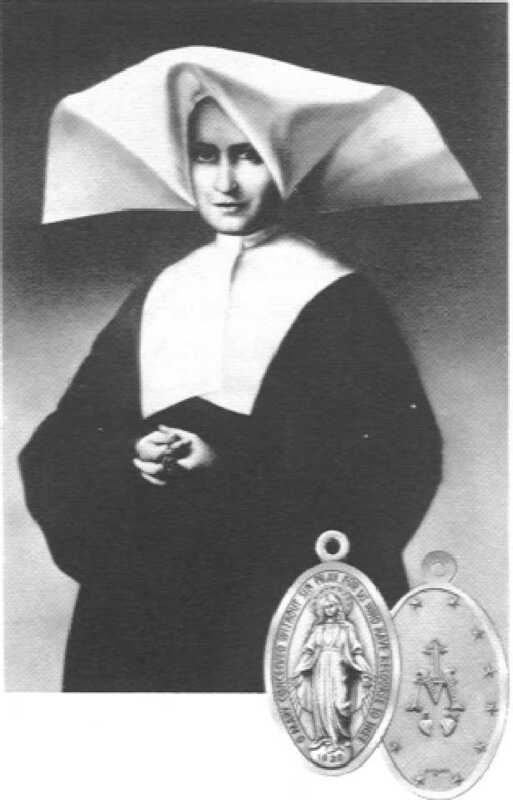 She entered the Daughters of Charity in 1830 in Paris, France. The Virgin Mary appeared to Catherine three times during this same year. In one of these apparitions, Mary showed Catherine the medal of the Immaculate Conception (also known as the Miraculous Medal). Mary asked Catherine to have the medal made and also that she spread devotion to it. During this time, only her spiritual director knew of the apparitions. She told her superior everything about the apparitions in 1875. Catherine died in 1876, and was canonized in 1947. St. Catherine Laboure, pray for us! "Whenever I go to the chapel, I put myself in the presence of our good Lord, and I say to Him, 'Lord, here I am. Tell me what You would have me do.' If He gives me some task, I am content and I thank Him. If He gives me nothing, I still thank Him since I do not deserve to receive anything more than that. And then, I tell God everything that is in my heart. I tell Him about my pains and my joys, and then I listen. If you listen, God will also speak to you, for with the good Lord, you have to both speak and listen. God always speaks to you when you approach Him plainly and simply."